Cuddalore Cuddalore.ogg pronunciation (help·info) (Tamil: கடலூர்) is a fast growing industrial city and headquarters of Cuddalore district in the Tamil Nadu state of southern India. Located south of Pondicherry on the Bay of Bengal, Cuddalore has a large number of industries which employ a great deal of the city's population. However, one industrial pocket -SIPCOT - has also secured it a place in the dubious club of global toxic hotspots owing to the area's high levels of pollution. Lignite Mines .at Neyveli Neyveli is 50 kms. from Chidambaram through Vadalur. The Lignite mined here is used to fuel two thermal power stations in Tamil Nadu. Apart from fertilizer and LECO (Coking coal) a number of by-products are also produced from the lignite. The biggest open cast mines can be found here. Silver Beach - Devanampattinam It is a beautiful golden sandy beach on the eastern side of the Cuddalore New Town. With the help of the District Administration, Cuddalore new town, the Cuddalore Municipal Administration, Tourism Department and other private organisations have joined together to create the entertainment for the people. Fun activities like boating, horse riding, a children’s park have been created. The District Annual Summer Festival held in the month of May-June. Port Novo It is 23 kms by road and 8 kms by train from Chidambaram, The place is also called as Parangipettai for its earliest european association with the Portuguese, the Dutch, the Danish and English. It was formerly a major seaport town in the district. The marine biological research station of the Annamalai University is located here. A historic Portuguese fort can also be seen here. The Samiar pettai beach nearby is good location for swimming and water sports. Bhuvanagiri It is on the banks of the river velar is the birthplace of the Saint and Guru Ragavendra Swamigal who has attained Mukthi at Mandralayam in Andhra Pradesh. A large number of devotees are visit this place and do worship here now a days. Hogenakal Falls5. Padalesearar Temple - Cuddalore It lies with in the city limits of the Cuddalore. Arulmiku Padaleswarar and Arunthava Nayaki are the presiding deities this Siva Temple here, sung by Appar, Thirugnana Sambanthar, Arunagirinathar and other Shaivite philosophers. 6. Devanatha Swami Temple - Thiruvanthipuram It stands on the edge of the Gadilam River in Cuddalore. The great philospher Sri Ramanuja, the disciple of Lord Vishnu lived in this place. 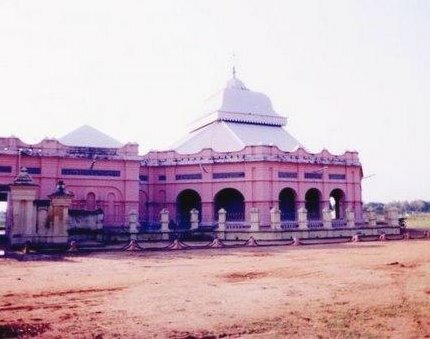 This temple dedicated to Devanayakaswami is well known. 7. Veeratteswarar Temple - Thiruvathigai It is on the banks of the river Kadilam near Panrutti. It is one of the 108 important shrines of Lord Siva. The temple has many intricately carved sculptures. Arulmiku Veeratteswrar and Periyanayaki are the presiding deities of this temple. Hogenakal Falls 8. Vridhagiriswarar Temple-Vridhachalam There is an ancient Siva temple dedicated to Lord Vrithagiriswarar (Periyamalainathar) and His consort Virdhambigai (Periyanayaki). The 72 dance postures of Bharathanatiyam are chiselled in the walls of the temple.